There are a lot of clock applications for the iPhone and iPad so what makes Touch LCD stand out from the rest? For starters, it works and looks really nice right out of the box but also provides many customizations to make it your own. The alarm features are second to none as it allows you to add and customize as many as you want. You may also customize the color of the display, whether to show it inverted or not, and customize how the time is shown. Oh and did I mention that it will speak the time for you as well? Touch LCD sports a very intuitive interface, albeit not what you expect from an iOS app. Instead, the developer was very clever in implementing one that resembled that of a real LCD screen that you might see on a clock, or perhaps a personal digital weather station. The graphics are crystal clear and very clean with large buttons. Upon starting the app, the default modern clock display is shown. 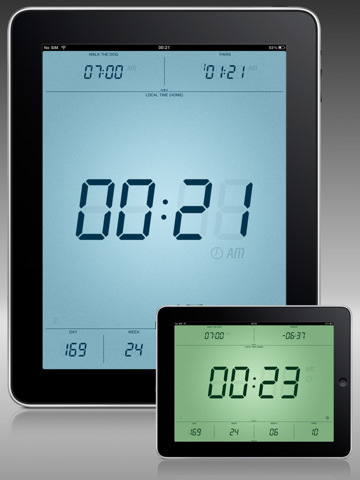 Simply swiping horizontally provides an alternative display, as well as a stopwatch, followed by a countdown clock. Your next alarm and the time remaining until its goes off is displayed in the top quarter of the screen and the date is displayed on the bottom quarter of the screen. The settings for Touch LCD are abundant. Options are: alarms, time zones, notifications, display, screen saver, speaking clock, and night mode. The alarms are a welcome feature to iPad users since there is no way to create alarms with the default software unless you create one using the calendar. Creating an alarm is very straightforward as you simply punch in the four digits for the time, and choose AM/PM. From there you can name the alarm, change it’s beep pattern, choose the days it will be active, adjust the snooze, and set whether or not you want a wake-up test. The latter will provide a simple visual touch test when the alarm goes off to ensure you are really awake. The alarm tones are not your average “ringers” that come bundled with, say, the iPhone. Instead you can choose from a few different beeping patterns, akin to those on a digital wristwatch. Another nice feature of Touch LCD is its screen saver functionality in which you can choose to have the screen dim to a specified level of brightness after a few moments. This is nice when you are trying to fall asleep and the iPad’s sheer brightness can keep you awake. Touch LCD is a great first product from Light Pillar. Their attention to detail and elegance is welcome and I hope to see more from them in the future. AppSafari review of Touch LCD iPad was written by Kyle Hayes on July 13th, 2010 and categorized under App Store, iPad apps, Productivity, Universal, Utilities. Page viewed 6479 times, 1 so far today. Need help on using these apps? Please read the Help Page. Nice… But I’ve downloaded many clock apps in the past and found that I really don’t use them. Maybe I’m missing the point! @Lisa, you know, I find that true as well. Even this one, I only used as my alarm clock for a few days then stopped. It was out of my routine to not use a normal alarm clock and to charge my iPad at my bedside instead of on my computer.